I read this book on a whim, purely because I had recently read some reviews praising Margaret Atwood’s writing. This seemed like an interesting story to start with, so I decided to just go for it and give it a try. Never did I think I would love this novel as much as I do! It’s hard to organize my abundant thoughts of adoration and mold them into a coherent review, but I’ll do my best. One aspect of The Handmaid’s Tale that really stands out to me is the narration. The story is narrated by Offred, a handmaid who is struggling with accepting her new position in life. Before society was altered she was married and had a young daughter, but now she has no idea whether or not her loved ones are even still alive. Her voice is authentic, honest, genuine, and clear. As a reader, you’re able to really understand the conflicting emotions she experiences, the fear that resides within her, and the intense longing she feels to return to the past. Offred’s personality in the narration has a humanizing quality, and I couldn’t help but root for her the entire time I was reading. If this novel had been written in a perspective other than first person I don’t think it would have been nearly as effective in delivering the overarching message of the story. I can honestly say that I was never bored while reading this novel. There is constantly something going on, even when Offred is simply doing errands or sitting on the edge of her bed, remembering. There is always a lingering fear that she will be caught, that more restrictions will be enforced, or that circumstances will change yet again. This society is extremely different from the one we live in today (at least, in most ways) so immediately you want to know what is going on. Atwood does an excellent job of slowly leaking out vital information bit by bit- it’s enough to satisfy your thirst for the time being, but not enough to quench it entirely. The ending of the book really surprised me- it’s rare that an ending exceeds my expectations, because most of them never seem to quite fit the feel of the book as a whole. But the conclusion of this book was incredibly clever and brilliant. I don’t want to spoil anything, but trust me- it made me love this book even more! The general idea of this novel- the regimented society, the endless restrictions, the strict hierarchy of social classes and the absolute order of it all- raises several important and fascinating questions that are undoubtedly relevant in modern society. For example: What is freedom? Do we have as much of it as we believe we do? Can love be forced or manufactured, and how necessary is it in society and humanity as a whole? These themes are explored through Offred’s experiences as a vital role in the world of Gilead, and I found myself pondering many more questions long after I had finished reading the book. I think that’s a sign of a really good book- when your mind just can’t stop thinking about it. Overall, The Handmaid’s Tale is one of the best books I read in 2014. I will most likely read it again sometime, and I’ll definitely be exploring Margaret Atwood’s other books. Would I recommend it to a friend? : Absolutely! Especially if they like books like George Orwell’s 1984. This reminds me of that book a lot, only with more emphasis on the role of women in society. Have you ever read this book? What are your thoughts on it? 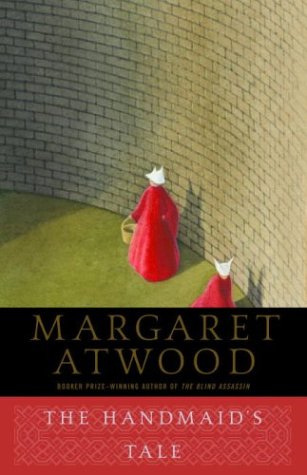 Are there any other books by Margaret Atwood that you would recommend? Let me know in the comments section below! Thanks for your kind words! 🙂 I hope you enjoy reading it, whenever you get around to it! Excellent review! I thought this was a really striking book, and like you said, it’s really gripping as we slowly find out more about the society. I would definitely recommend Only Ever Yours by Louise O’Neill, it has been described as a YA Handmaid’s Tale and is completely gripping and terrifying. Oooh, Only Ever Yours sounds really cool! I’ll definitely have to check that one out- thanks for the recommendation!